Who wants to be BOOED when they can be SPOOKED?! AM I RIGHT? 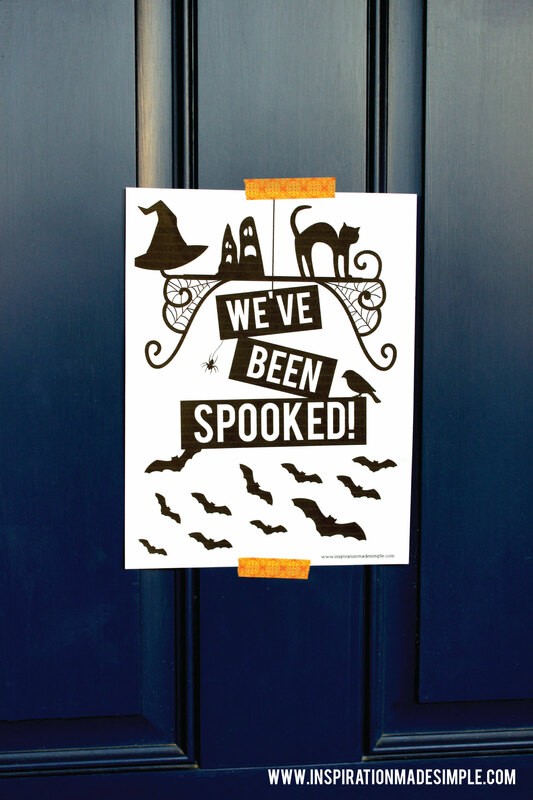 We needed knew Booed Printables since we used my other Booed Signs two years in a row, so I went ahead and whipped up some You’ve Been Spooked Halloween Signs to use this year. Because I’m ink cautious I went with a spooky white and black design. If you’re also looking for a new Booed printable to use this year, then read on, because you know I’m going to share with you! My children typically dictate what goes inside our Booed Gifts. This year inside the pumpkin basket we put a pumpkin cup, some silly string, wax lips, and DIY Halloween Takeout Boxes full of treats. I don’t know about you, but if I was a kid and I found this on my porch, I would be hella’ excited! If you’ve never Booed anyone before, it’s simple! First, download the Spooked Signs and instructions below. You’ll need to print 1 copy of the 1st page and 2 copies of the 2nd. Now comes the fun part. Make or buy treats to put into a basket, a bag, heck, even inside a pumpkin! Get creative with what you do. You’ll need two of whatever you come up with. Next, put together your packages. 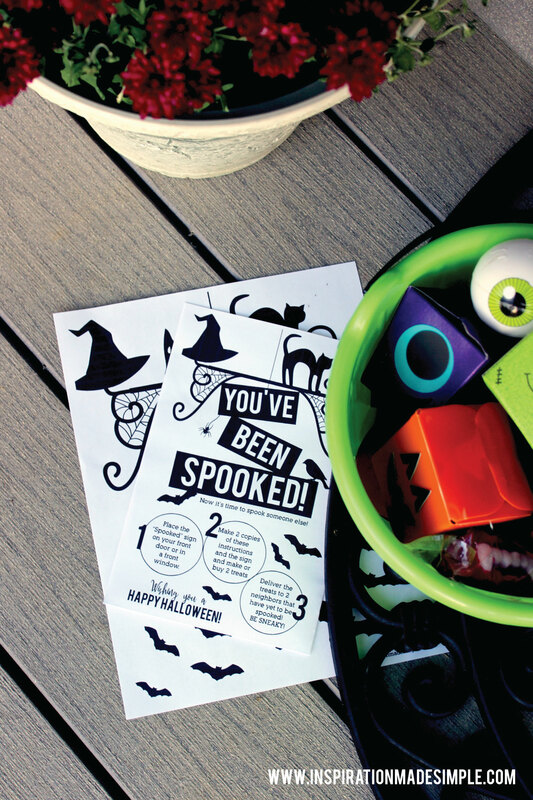 Include one copy of the “You’ve been spooked” instructions and one copy of the “We’ve been spooked!” sign in each. And here comes my kids favorite part: the sneaky delivery! We usually wait until dark and we pile into the car. We determine the neighbor we want to boo, I drive them there, drop them off at the house next door and then drive down the street a little bit and go dark. The kids go into ninja mode and stealthily run up to the front door – drop the package, ring the bell and HIGH TAIL IT THE HECK OUT OF THERE! Usually they make it to the side of the house and then hunker down until the neighbor has down the confused looking around until they see the package at their feet and bring it back inside. Once the door is shut they continue in ninja fashion back to the car. Then we do it all over again at the 2nd persons house. By the time we get home, they are all hyped up from the adrenaline and are in great moods! Then they discuss how long they think it will take until we get booed ourselves and get to do it again… because it’s inevitable! 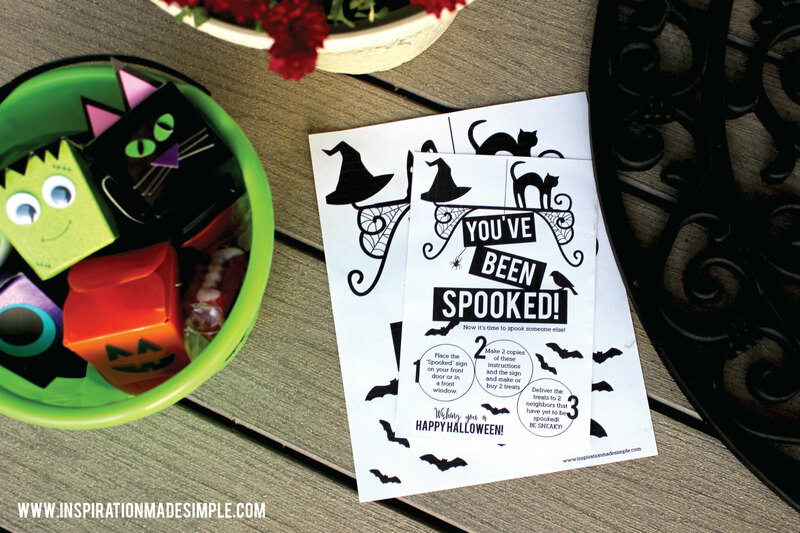 If you think you’re up for the challenge (and fun), then download the Booed Printables and hop to it! 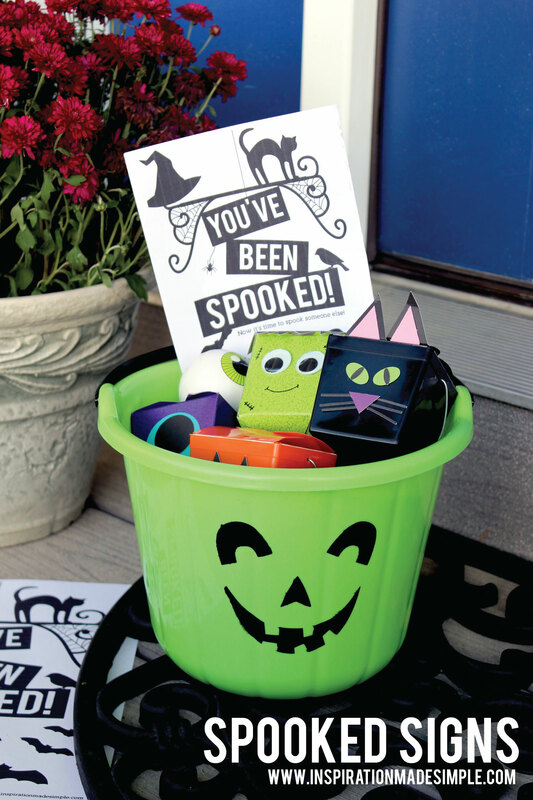 Download the We’ve Been Spooked Halloween Printables in pdf format.